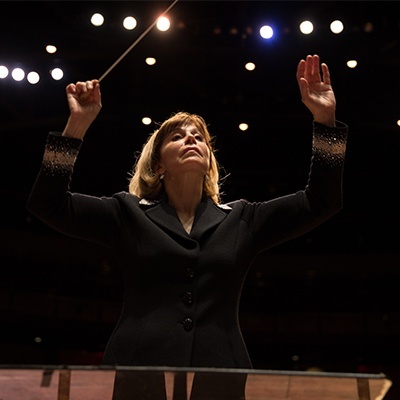 Building on the momentum of our opening night, JoAnn Falletta and the VSO return for Ravel’s most famous work, Boléro. This melodic, whimsical work – originally composed as a ballet – is a perfect example of Ravel’s preoccupation with restyling and reinventing dance movements. The program begins with the Fourth Piano Concerto by Canadian composer André Mathieu, performed by guest artist Alain Lefèvre, who worked with conductor and composer Gilles Bellemare to reconstruct the composition that was lost for 70 years. At the height of the concert is Poulenc’s most celebrated work, Gloria. “Winter is coming….” Usher in the season with the VSO in a program featuring an homage to winter featuring Glazunov’s picturesque Winter from The Seasons. Celebrated cellist Julian Schwarz returns with Tchaikovsky’s delightful Rococo Variations. The VSO then takes a trip north to Finland for Sibelius’ evocative Fifth Symphony. We close with a rare treat on the concert stage, the climactic Pas de Deux from Tchaikovsky’s beloved Nutcracker. Composed during a health retreat in the Bohemian spa town of Teplice, in today’s Czech Republic, Beethoven’s Symphony No. 7 is one the composer considered to be among his best works. It gained instant popularity for its second movement, Allegretto, which was encored at the premiere in which Beethoven conducted. To open our program, the VSO is joined by soloist Sirena Huang for Mendelssohn’s Violin Concerto, the largest orchestral work by the composer. Guest conductor Scott Yoo, Chief Conductor and Artistic Director of the Mexico City Philharmonic, takes the helm of this magnificent Mozart program. Symphony No. 39 is the first of a set of three symphonies, the last set he composed. Its opening is “so majestic that it so surprised even the coldest, most insensitive listener.” The program opens with the Overture to The Magic Flute before Mozart’s Sinfonia Concertante, a work that blends symphony with concerto in this small-ensemble masterpiece. With its rich harmonies and incandescent themes, the work has inspired arrangers and composers for centuries. This beautiful piece, the only surviving complete concerto for this combination of instruments, features principal musicians of the VSO. Join the VSO for a Night at the Movies! From the composer of the score to Crouching Tiger, Hidden Dragon, Tan Dun’s Pipa Concerto features a first for local audiences. The pipa is a traditional Chinese four-stringed instrument, and soloist Wu Man is one of the world’s leading performers, having worked with Yo-Yo Ma and the Silk Road Ensemble. John Williams’ hauntingly beautiful music from Steven Spielberg’s 1977 film Close Encounters of the Third Kind will be one of the many film scores featured. The 2018-19 Classics Season comes to a close with one of the greatest symphonies of all time. Mahler’s Symphony No. 2, among his most popular and successful works during his lifetime, demonstrates his vision of beauty in the afterlife and in resurrection. Characteristic of Mahler, the symphony is written for a huge orchestra and runs the gamut of emotions in the contemplation of life and death.